The first round of voting in the Egyptian presidential election will be May 26 and 27, announces election commission. Egypt officially announced on Sunday the dates for the country’s next presidential election, reports the Associated Press (AP). The Egyptian election commission set the first round of voting for May 26 and 27, with results expected by June 5, according to the report. If a second round is necessary it will be held by mid-month with results announced no later than June 26, the commission said. The announcement comes several days after Egypt’s powerful former military chief Abdel Fattah el-Sisi, who led the overthrow of Islamist President Mohammed Morsi last summer, announced he would run for the presidency. 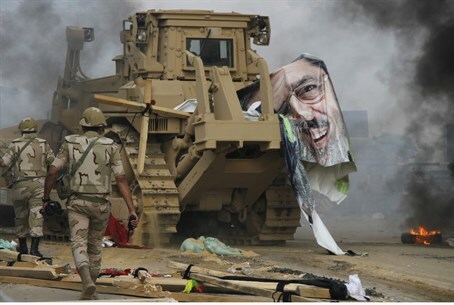 Morsi was removed from office on July 3, amid massive protests demanding his resignation and accusing him of monopolizing power and mismanagement in the face of myriad economic and social problems. The military, led by Sisi, stepped in to remove Morsi and backed a political road map that promised presidential and parliamentary elections. Morsi’s Muslim Brotherhood has already voiced its opposition to Sisi’s bid for the presidency, saying he was not a suitable candidate. Street clashes have continued almost daily since Morsi’s ouster. On Friday, four people, including an Egyptian woman journalist, were killed in Cairo as police clashed with Islamists protesting against Sisi's presidency bid. To officially make a bid for the presidency, noted AP, Sisi would have to collect at least 25,000 signatures from 15 out of Egypt's 27 provinces in a petition demanding he runs. So far, only one other candidate, leftist Hamdeen Sabahi, who took third place in 2012 presidential elections, has said he would run. The commission said that the window for nomination of candidates will open Monday until April 20. A three-week campaign period is slated to start on May 3, according to AP.